Place the white vinegar, spring onion, ginger, Shaoxing wine and water into a large pot and bring to boil, then simmer for 20 minutes. Add the pork belly and braise for 1.5-2 hours on low heat or until it is soft and tender. Place a small saucepan on medium heat and add the peanut oil and garlic then cook, stirring continuously until golden brown. Off the heat, add the spring onion and stir continuously until it is slightly cooled down. Add the vinegar sauce, black vinegar, chilli and light soy in the pan, taste for balance and seasoning. Heat up a large heavy based pan on high until almost smoking hot. Add the peanut oil and heat for 30 seconds, then seal the pork mince until brown. Off the heat, add vinegar sauce and light soy, stir through. Blanch the noodles in boiling water for 2 minutes then place in a bowl with the spinach. Add the mince into the bowl and stir through the noodles and spinach. Divide equally onto 6 plates. 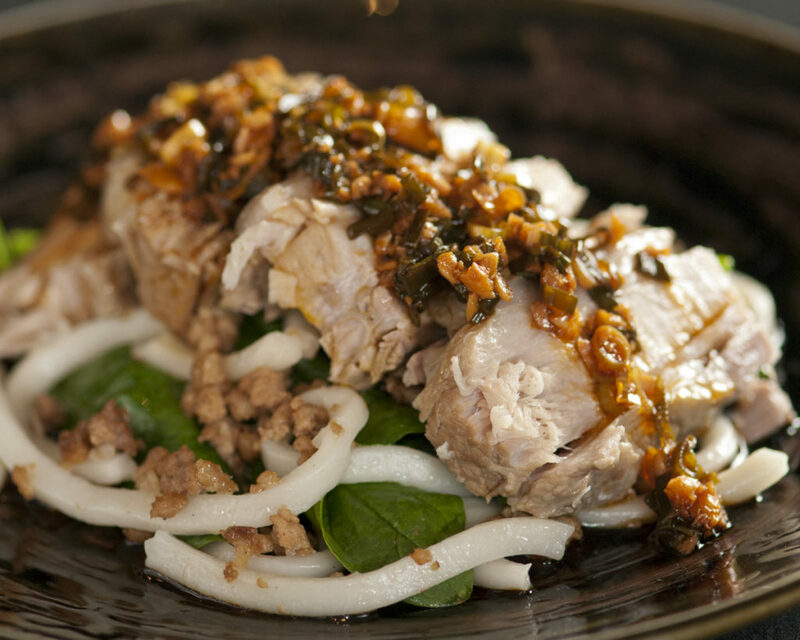 Slice the pork and divide into 6 serves, placing on top of the noodles. Pour sauce over the pork and serve.